The Rum & Coke: a cocktail as ubiquitous as it is unremarkable. Sweet and easy to drink, there’s a reason why it’s the go-to drink order for so many people. And while there’s nothing inherently wrong with it — it falls squarely in the respectable end of the cocktail spectrum — it’s just so damn norm-core. And let’s be brutally honest and generalize here: The Rum & Coke is for dad’s who listen to Jimmy Buffett, and bros who wear sunglasses on the backs of their heads. I know there are Rum & Coke partisans out there who will beg to differ, and I feel you. It’s not that I’m averse to enjoying a cold Cuba Libre on a hot summer afternoon, but the proliferation of high-fructose corn syrup-saturated colas makes them a less than optimal mixer, especially, for those who prefer natural ingredients. Might I, instead, suggest the Dark ‘n’ Stormy? Like the Rum & Coke, the Dark ‘n’ Stormy is a simple, unfussy, built-in-the-glass rum cocktail — albeit one with a lot more character and flavor. A product of Bermuda, the cocktail dates back to 1860 when the Gosling family began producing their famous Black Seal rum. On the other side of the island, the British Royal Navy was making ginger beer, possibly as a means of treating seasickness. Eventually, the two ingredients found their way into the same glass. Get the full story, including the Gosling family’s fierce protection of the original recipe, here. The Dark ‘n’ Stormy is a basic rum cocktail elevated to exotic heights. The spiciness of the ginger cuts the sweetness of the rum, making it both complex and refreshing. By contrast, the all-sugar Rum & Coke is too one-dimensional to compete. As a bonus, ginger is really good for you! Scientific studies suggest that ginger root is helpful in treating nausea (the Brits were onto something), inflammation, headaches, menstrual pain, arthritis and possibly even heart disease. However, not all ginger beers are created equal; amounts of real ginger may vary from brand to brand so be sure to read those labels. 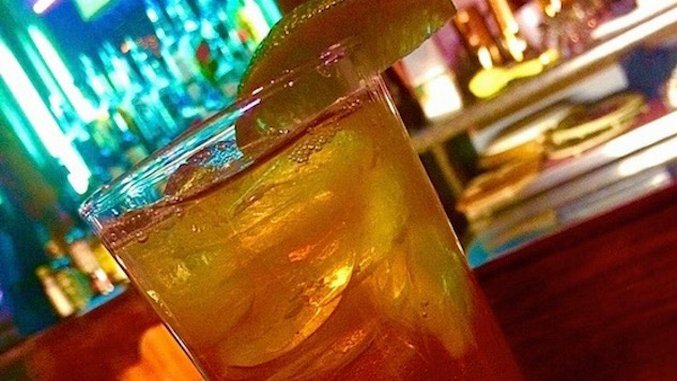 Obviously, the ginger in your Dark ‘n’ Stormy is not a panacea, but it’s probably healthier that most of the other things you’ll put in your body on a typical night out so ditch the Rum & Coke and drink up! Directions: In a Collins glass filled with ice, add rum and top with ginger beer. Garnish with a lime. Jim Sabataso is a writer, cocktail enthusiast, and bar director for The Palms Restaurant in Rutland, Vermont. Follow him on Twitter @JimSabataso.